We collect, clean, & turn daily. The eggs are never washed. We only ship Monday-Wednesday to ensure none get stuck over the weekend at the post office. We package very tightly with an assortment of shipping materials, including bubble wrap, poly-fill, peanuts, Styrofoam, shredded newspaper, egg cartons, etc. We do our VERY best to ensure your eggs arrive safely. We use USPS to the contiguous 48 states for our Standard Shipping. Our breeding stock is originally from Holderreads' Waterfowl Farm & Preservation Center, but have been removed long enough that they are a separate line. 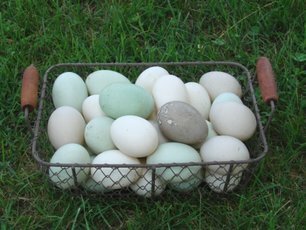 We selectively breed for multi-colored eggs (white, tinted,"blue" and green), medium weight and body type, and evenly-marked individuals. We strive to produce "show quality" birds, even though this breed is not yet recognized by the American Poultry Association. We are members of the Livestock Conservancy who considers these ducks "critically endangered". Our birds are raised outside on pasture to allow for nature behavior and increased foraging. In the growing season, very little supplemental feed is needed. Our line is especially adapted to our hot, humid, ever-changing southeastern weather! They lay consistently from Dec./Jan. - Oct/Nov. yearly. The average # of eggs per hen is 260-280. We produce all possible colors in our flock, including Lavender, Silver, Tri-color, and the more typical Black, Chocolate, and Blue. "These are some of the ducks you sent me this spring. Aren't they gorgeous? I am so happy to have [lilac] show up. I love these little guys." - J.T. "i LOVE the blues!!! happy to have them" - M.W. No ducklings or ducks for sale to the public in 2019. Some hatching eggs will be sold. Ducklings are sold Straight-Run only, until they are fully feathered (around 9-10 wks old). 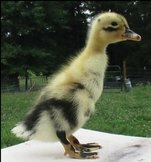 Price is determined by age of duckling when it's picked up or shipped out.